At Underriner Volvo Cars, we love to help people in the area decide on the right vehicle. An SUV has many benefits if you need cargo space, love to be higher off the ground, or have a lot of things or people to transport. An SUV is also a great vehicle for offroading and road trips. If you like to travel, you don't have to worry as much about an SUV using a lot of gas. Newer SUVs have the ability to use less gas and can still perform as well as older SUVs. 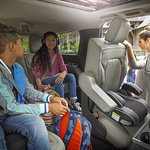 An SUV is a great way to get everyone out of town for a quick trip. They are usually roomier than a car or a truck and have conveniences like cup holders and entertainment options that keep everyone happy for the trip. You can also store more items like suitcases and survival kits easily in an SUV.